The Interpreters are Columbina Andreini (Michele Schultz) and Trinket Bramage (Lisa Oberg). One speaks Italian, One speaks Blonde. Laugh and listen while the mayhem ensues. This 2-woman a capella singing group, with a special appearance from their Cabana Boy Scapino Confidanti (Michael Winchester, Jr.), both tickles your funny bone and tames your savage beast with music both irreverent and sweet. Dirty ditties (she said "D"itties) and bawdy tunes are mixed with the craziness of the ladies' mis-interpretation. This show was performed before a live audience and includes both original material and comic renditions of both naughty and sweet traditionals. This recording is rated PG as it includes adult concepts that may not be appropriate for children. However, if you minor gets the jokes, they didn't learn it from us. The Interpreters prefer to be clever and therefore there are no "dirty" words on this recording, just insinuation and your mind. 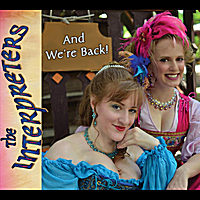 The Interpreters perform at Renaissance Festivals around the country. They are home based at the Maryland Renaissance Festival where they can be seen performing in the pubs and stages or wandering the streets of the village. Blissmass - And We're Back!